Welcome to Show and Tell Friday!! 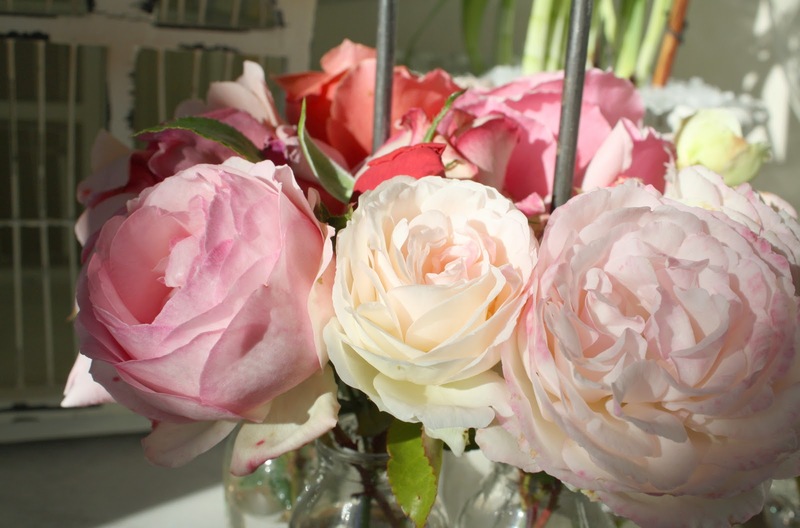 I know a few weeks ago I shared some roses from my garden and I thought they might be my last bouquet of the season but I was wrong! These are for sure my last roses of the season! I pruned all my roses yesterday and now there are nothing but stumps left but I did get one last bouquet out of them! I sort of went crazy with the photos because they looked so pretty with the morning sun shining on them! I'm still waiting to hear if I got the job I interviewed for. I'm constantly checking my email and every time my phone rings I get so nervous! I've sent out over 60 resumes and I've only had one in-person interview! I'm hoping things pick up soon now that the holidays are over! This week I'm joining in on Pink Saturday at "How Sweet the Sound"
I am keeping you in my prayers Cindy. Just rest and believe that that perfect job will be yours soon. As always, thank you for being our hostess each week. I believe that yours is the first party I ever linked up! They are so pretty! I have been amazed that my roses are still blooming here in Dallas too, even though we have had a couple of hard freezes. thanks for hosting Cindy! Your roses are beautiful! Good luck with the job hunting. Thank you for hosting. 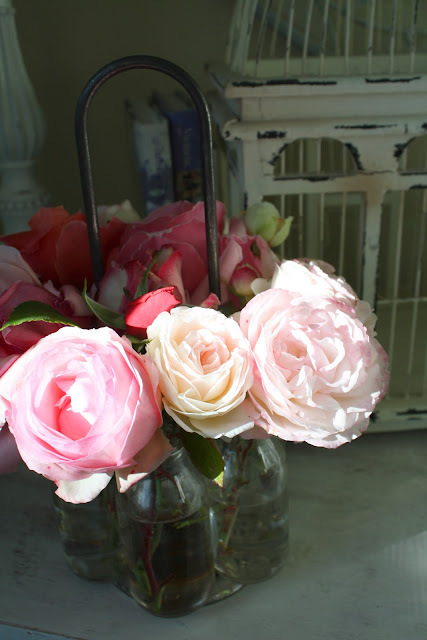 Oh how I wish we had some roses right now. Only snow on the ground, but not much so I'm not complaining too much. Prayers coming this way from Illinois to you too, Cindy! Thank you for showing pretty roses too. Your beautiful HEART shows in your blog. Cindy, this is your year my dear! Your job is waiting for you. Thanks for hosting my dear! Keep you chin up. Oh to still have roses in the garden!! They are lovely! The holidays definitely slow things down with the job search and interview process, so things will start picking up soon! All the best to you, Cindy!! Thank you so much for hosting. 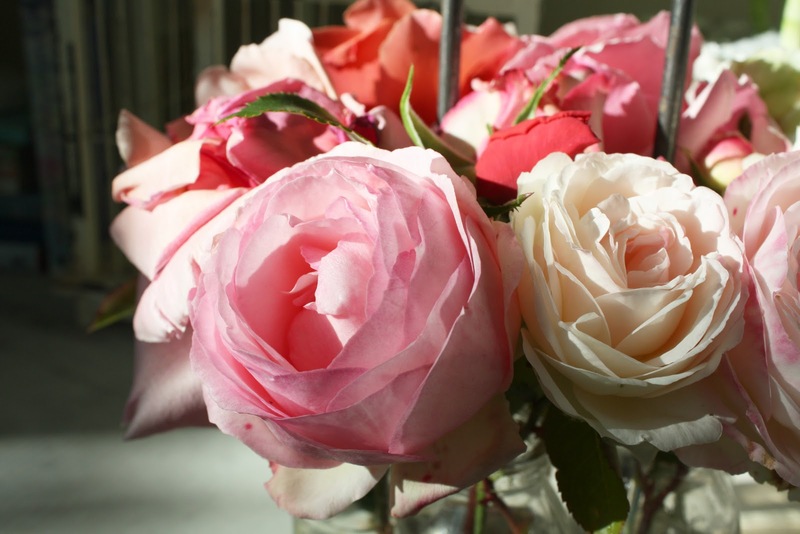 Your roses or gorgeous! Happy New Year, Cindy! What gorgeous roses! I'm sure the scent is just lovely. Thanks so much for hosting! I wish you nothing but the best this year! Absolutely gorgeous, Cindy! So nice to see roses in January! Fingers crossed for the job interview! Those roses are GORGEOUS! Thank you so much for hosting and Happy New Year! Your flowers are gorgeous! Thank you for hosting! Your flowers are just beautiful, Cindy! Thank you so much for hosting "Show and Tell" every week - I always receive a lot of visitors when I join your party. I wish you all the best in the new year! Oh, what a nice bouquet you put together. Keeping you in my prayers for your job search. Thanks for hosting. 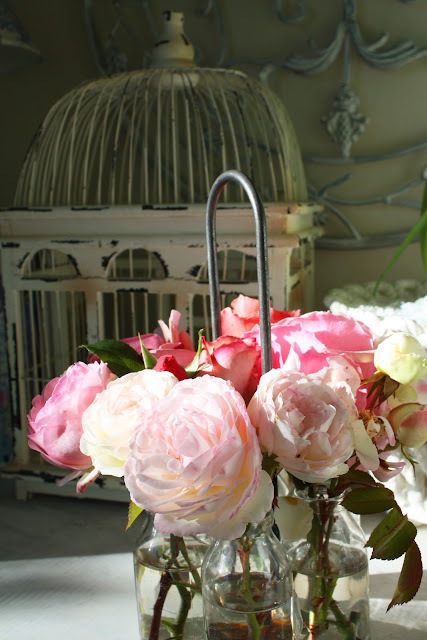 Your roses are to die for!! Good luck on your potential job offer! I hope it all works out and this is the best year ever for you. Keep us posted. So, so pretty! 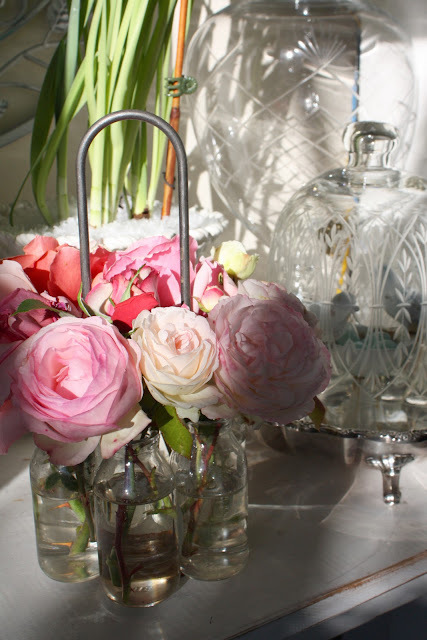 You are lucky to still have had a few roses left! They do look so pretty with the light shining in on them! I'd love for you to come link up with my Homemaking Link-Up Weekend! 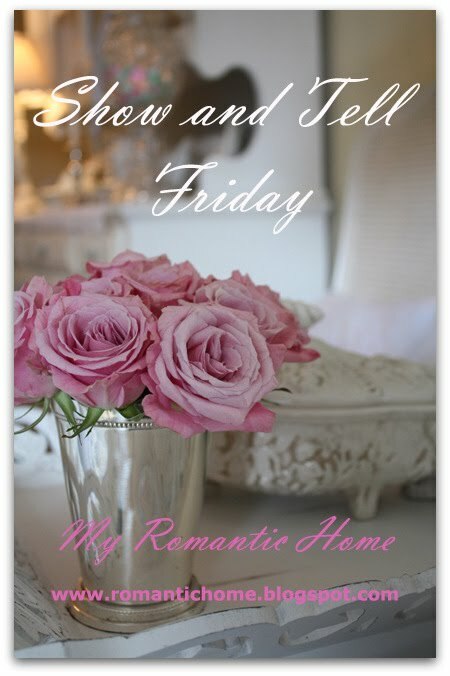 You can link any homemaking post---and as many as you want! Your roses are stunning! Good luck with that job - keeping my fingers crossed for you! Cindy..This is my first time to your blog and I am completely overwhelmed by what I see. Beautiful, aboslutely beautiful. I had heard about your blog in several places and about your linky Friday party so came to join. Thankyou for doing this wonderful service of hosting. It truly helps others to connect. I am a brand new blogger of seven weeks and am thrilled to have met so many talented and amazing women like yourself. I am now following your blog and also receiving it by email. I can't wait to take the opportunity to explore the wonderful things you've shared over the years. Thankyou for the inspiration already. Thank you so much for hosting such an amazing party each week Cindy. I love coming by to see the gorgeousness that is linked up. I'm especially in love with your roses. I wish they would grow like that in Phx! Your roses are lovely! I wish I still had some growing in my yard. Sending you positive thoughts on your job hunt! Good luck i hope you get the job..and beautiful roses, i love roses..Thank you for your inspiration. Sending good thoughts your way about the job Cindy!!! Your pictures are gorgeous-I shared my love affair with peonies post :) Thanks for hosting!! Thank you so much for sharing your life with us - it's lovely to hear what you're up to away from your blog. Do let us know as soon as you hear...and in the meantime...THANK YOU for hosting!! I linked up my Modern Country Style summary of 2011! I hope you like it! Good morning~I linked up my Easy Lace Shirt-which is more of a cape. It's a great project for a someone unaccustomed to sewing-or for a novice sewer. Thanks for hosting the party once again. Have a great weekend! 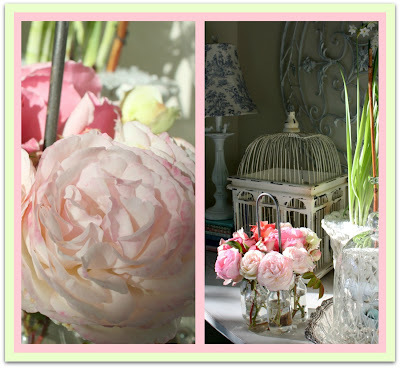 So happy your blog is back to normal... Gorgeous flowers! 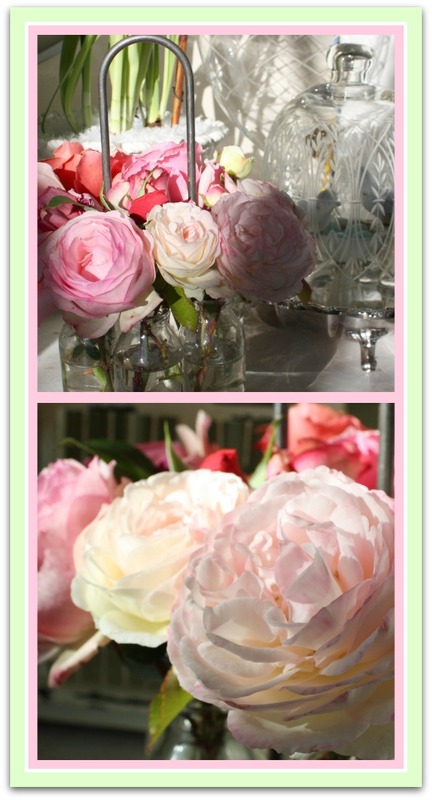 Such gorgeous flowers and photos Cindy! The lighting was just perfect! Thanks for hosting this:)Good luck on your interview, I wish the best for you in this new year! 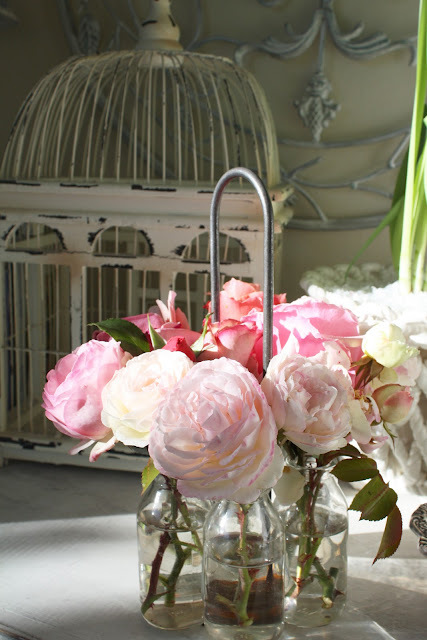 LUV your blooms in the little glass bottles! 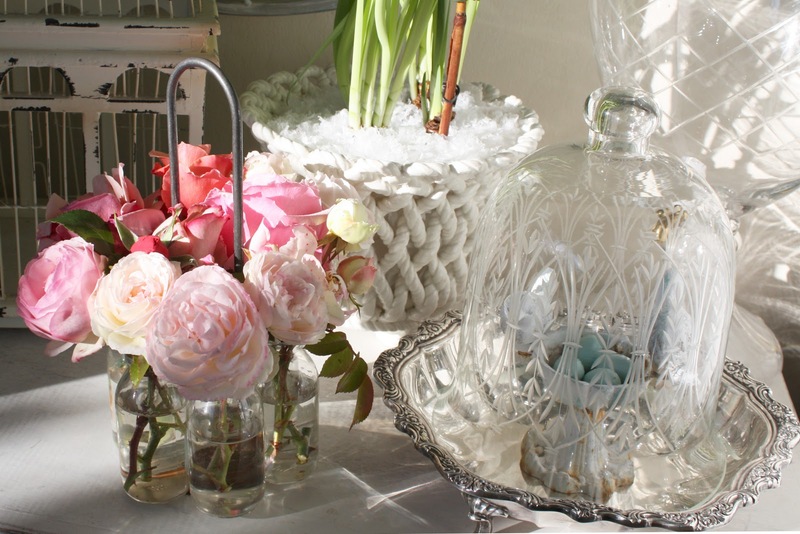 Beautiful, beautiful photos!, and the etched glass cloche with the little blue eggs in the mix, is to die for! makes them even more gorgeous. Beautiful pictures as usual from you. I'll be praying for you to get a job you really like. Hope you have a great weekend. 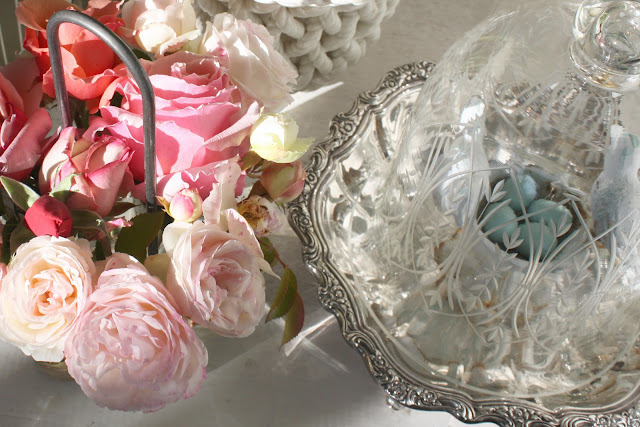 Your photographs & your roses are SO lovely! Thank you for sharing & hosting all the beauty. I'm sending all positive thoughts & keeping you in my prayers for the perfect job. 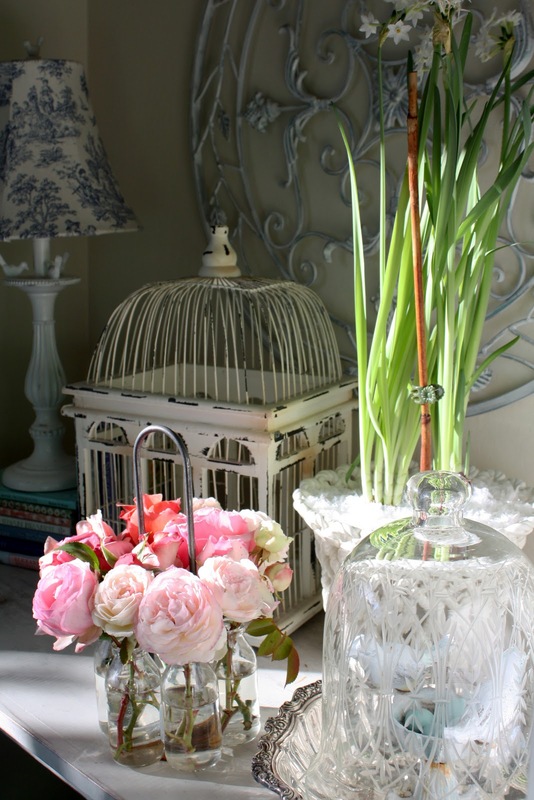 Your roses are gorgeous, and I love the little eggs under the pretty cloche! Your roses are stunning! Thank you for hosting. Best of luck to you in 2012! I can't tell you how many times I've hoped to log on and hear that you've found a new (and hopefully perfect) job. My fingers and toes are crossed that it happens soon! What an awesome , awesome blog! New follower. I'm linking up and finding your button for my blog so I never miss a post again! Thanks for hosting and I'll add you to my prayer list re a job.